Whenever there is a case of an emergency in a hospital and the patient needs some critical care right away, what is the first thing that the hospital crew do? They shift the patient from its ward to an ICU or the Intensive Care Unit. But wait a minute, how did they do that, means shifting the patient from one place to other. Yes! You guessed it right; they make use of a trolley that helps in transferring the patient from the normal ward to an ICU or anywhere. 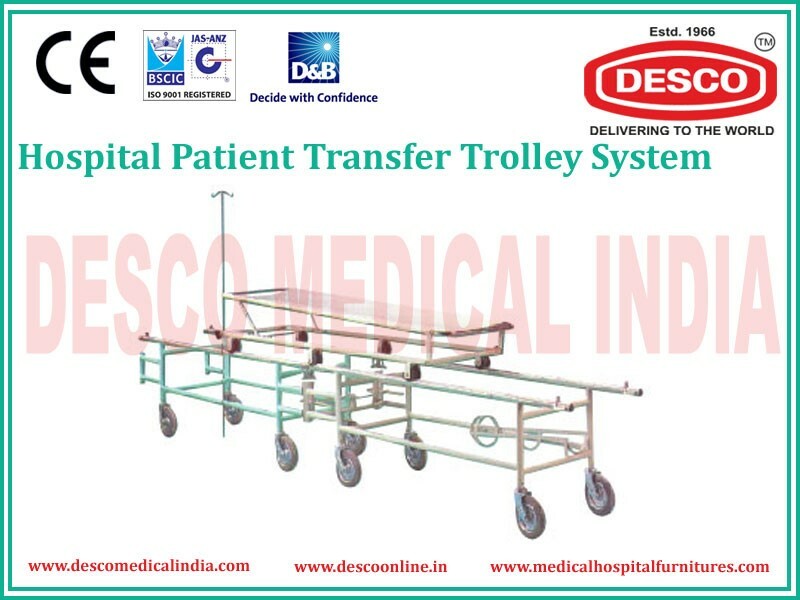 So as we can see that the transfer trolley plays the key role in the management of patients in a hospital. And to do that the quality of that trolley must be great so that the patient doesn’t feel any pain in while getting transferred from one place to other. The trolley system consists of 2 parts; 2 under carriage and one stretcher. Moreover the stretcher can be raised from one end on a ratchet. 15 cms castors are used to mount the body section of the trolley over its base. One of the main features of the trolley is that it comes with some great components such as the adjustable I.V. Rod, a cylinder cage and also along with a Utility Tray to perform several functions in an easy and efficient manner. The normal size of one stretcher trolley is 187*57*90 in centimeters. All of these products are exported and supplied at a great wholesale competitive price by the DESCO India company. So we assure you that the patient will have a great comfort due to this best in class trolley for the transfer of patients from one place to other.